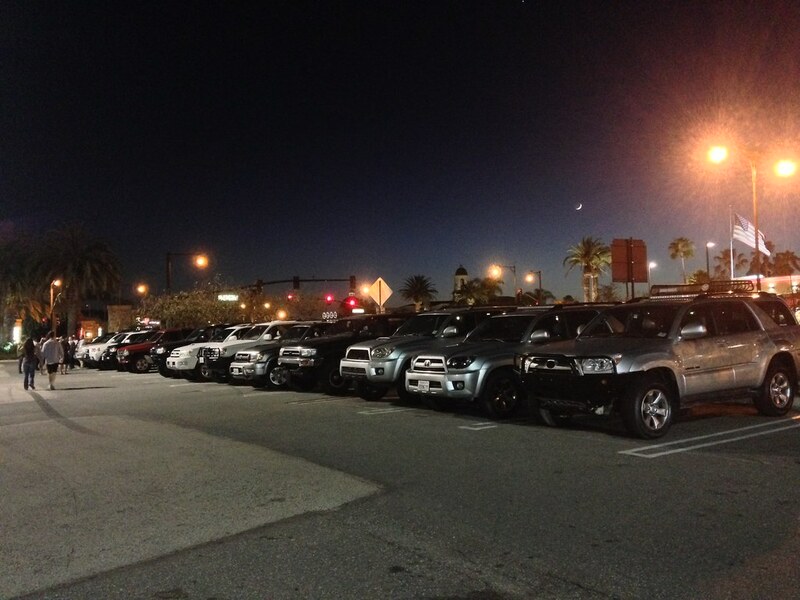 OFFICIAL Southern California T4R.ORG/4Runners.com Meet and Greet! Discussion in 'California' started by James, May 18, 2014. $1 Chicken Tacos, $2 Steak Tacos, $4 Bottle Beers, $6 Patron, Jameson, Ciroc Shots. Private parking lot, Large Patio with Fire Pit, Video Games, Giant Jenga, Darts, Couches, TVs, Projectors, Full Bar (21+ Inside Bar). Parking lot style where we can all talk and check out rigs, then potential trail runs after. Ideal spot for such a thing would be a place to eat... we can all get some grub and check out some nice rigs. All gens welcome! Why no wheeling, James, you chicken? When I first joined the T4R.ORG forum, my 3rd gen was 2WD, I didn't know much about automotive technology. Wheeling meets were already a no go for me, until brian2sun and driffter33 invited me for a fun 2WD capable run. It was no excitement for their trucks, but I had a lot of fun. The only reason that ever happened is because of a parking lot meet at The Hat in Fullerton, CA. Bringing people together is the sole reason for this meet, and the potential trail runs and gatherings that may succeed it. LMR and Bob like this. Molina4*4 and PisaRunner like this. These are great but I snuck over to t4r and grabed a look. Thanks for spins this every month. I might try to get to the next one and drag my neighbor out. 29 palms is kinda out of the way with gas prices. Tomorrow at 7pm! Same spot! New meet back in action! 6/19/18, be there!